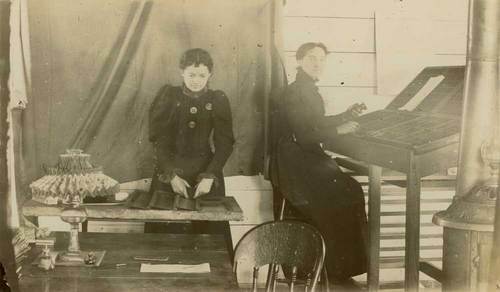 A view of two women at work in the "Kansas Workman" newspaper office in Quenemo, Kansas. The monthly newspaper, edited by A. P. Riddle, was published in support of the Ancient Order of United Workmen (A.O.U.W.) principle that the interests of labor and capitol are equal and should receive equal protection.